In a race against time take on the roles of a London's Air Ambulance Pilot, Paramedic and Doctor. To create a learning game based on the operations of the London Air Ambulance team. As a way of raising the aspirations of young people from disadvantaged backgrounds to pursue STEM subjects and careers. After an initial round of research I developed a concept where the player will assume the roles of three characters each representing a different profession associated with the London Air Ambulance service: Co-Ordinating Paramedic, Pilot and Senior Doctor. At this stage in the cycle I like to sit with pen a paper and work up a set of scamps which can then be used as the basis for storyboards and concept documents. After winning the pitch we were invited to The Helipad at The Royal London Hospital Whitechapel, where we were able to interview members of the LAA crew. This proved to be very insightful and gave us a far more accurate understanding of the the day to day tasks undertaken by the team. 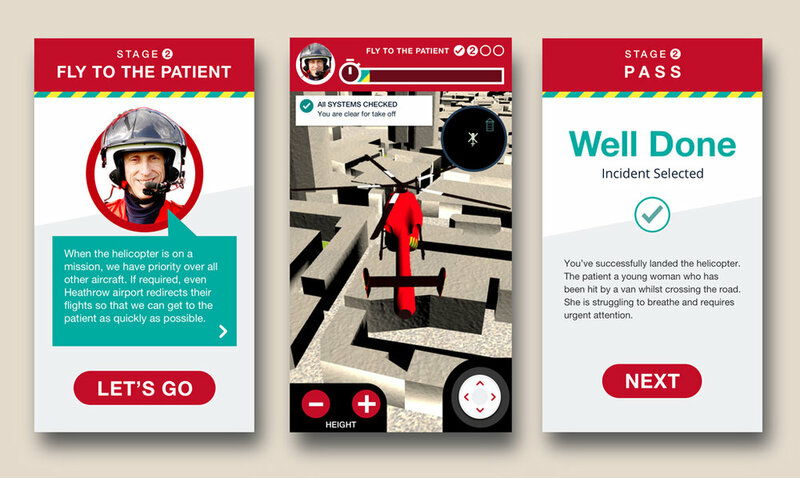 I created wireframes for the three activities that would be the the core of the app: Select Emergency and Hospital, Flying The Helicopter and Treating The Patient. I created a series of prototypes using Invision which we used to test and then iterate on. We partnered with science education centre Centre of The Cell to ensure that the game’s interactions reflected the learning objectives for key stage 3 and were an accurate reflection of the three professions. It was a real joy to get started on the look and feel for such an exciting subject. I worked through several iterations using the red, yellow and green livery of the helicopter with it’s bold diagonals as a starting point. Part of the requirements of the look and feel phase of the project was to create the Helimed logo.